The solution is in mutual inclusion. We connect not only among us, with those who are physically at the convention but also with all the friends around the world who are connected to us virtually. The desire of the women is incorporated in us and, in addition to that, all the Kabbalists throughout the ages who operated on our level are participating in our actions and continue to operate even now. After all, nothing disappears in spirituality; all the forces continue to operate within the general eternal system. You will feel how they are behind us supporting us in an absolutely real way and compared to that our world is only an opportunity to get to know this reality. So everything stems from mutual incorporation. When a person wishes to be incorporated with others and to absorb their desires, he will feel internally that there is a great network of connections. He has to feel all the levels, all the forces, all the souls that operated in this network in the past and operate in it now. From there we draw all our powers; we are like babies who only need to let out a little cry, and from this little cry, just like for a baby, the whole network begins to operate. The “grownups” already know how to take care of us and what powers to pass on to us, how to strengthen us, and how to take care of us. There is no doubt that they will do their job. This is called raising MAN, a prayer, which I can raise according to my level. I ask the upper one to do this work, but I have to show Him that I am loyal to Him, which means that I place myself in His hands like a baby who finds himself in his mother’s arms and doesn’t worry about anything. He knows that he is in the safest place possible. There is nothing safer than being in a mother’s arms. In the same way, we too have to count on the power of Kabbalists that they will do the whole work. Clearly we have no power to do it. It’s only by our dedication and connection that we prove that we totally submit ourselves to the upper force so that it will take care of us. How Do I Copy The Image Of The Global Soul On Myself? Question: In the past humanity somehow regulated the evil it encountered, but today it seems that the evil has been set loose. Answer: We have advanced and developed in a constant ascent; our ego grew over the years until it has become “round.” We have always known what to do with it, and how to balance it. Time after time it pushed us forward to new achievements. We have always managed with it: We built, invented, and added something. The deficiency pushed us forward and we reached a filling. If we couldn’t attain it directly we had revolutions. 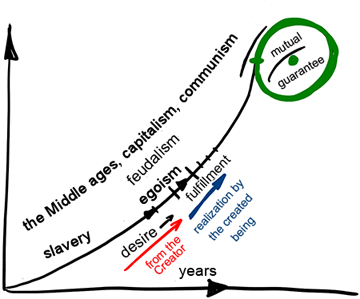 The generations have changed; there was a time of slavery, and feudalism, the Middle Ages passed, and capitalism came along, and eventually we have reached the last phase, communism. In a “round” state” there can be nothing but mutual connections based on mutual guarantee. We have to say here that it’s the Creator who evokes the deficiency each time, and by that, the created being receives the power and the mind to fulfill the deficiency. The changing of eras and special moments are typified by revolutions, since such transitions are only possible by troubles, by dramatic changes. So today, in our current state, we have to act according to the new leadership. All the old approaches and methods will not work today since they were all good up to the moment that we began to become “round.” Now we will receive blows since we aren’t adjusting ourselves to what is happening around us. These are not anyone’s insinuations, but the natural process of events: If you don’t adjust to the external conditions, you cannot blame anyone for the outcome. For example, what’s the point in blaming others if you went out on a cold winter day without warm clothes? In the same way, we are entering a new world now without having adjusted ourselves to it. It has been scientifically proven that in the new era we need a greater degree of unity, connection, and cooperation. But we remain the way we were and so we are not adapted to the new reality, to the force of the leadership that has closed us in a “round” system. For over a hundred years scientists and experts have been writing about that, so who is to blame if we don’t listen? The cost of our not adapting to the changed conditions will be global bankruptcy, systematic collapse, and perhaps even world war. How can it be otherwise if we stubbornly refuse to adjust ourselves to the unity and the connection that the new state requires? We are like the person who has killed his parents and is asking the court for mercy because he is an orphan. So the time has come to adapt ourselves to the global world, which will continue to “round up” even more. It’s impossible to go on living as in the past, the only way today is unity and connection, according to the world that is becoming one before our eyes. Question: How can I find out what I should focus on and what exactly my self-realization is? Answer: You will never be able to discern this by yourself. A person cannot find his place and self-realization unless he realizes himself within the group. Some time ago I had a bad car accident and my liver was injured. A part of my liver had to be removed. Can we say that this removed part of the liver has any realization now? When it was inside the body and was connected with all its organs, this part was providing the body what it needed and in turn it was receiving from the body all the necessary things. This is called realization. However, when this part is cut off from the body it doesn’t even know that it’s liver. Only if you decide to get connected to the body will you learn who you are. But for now you are simply a “stem cell” from which any organ can be formed and you don’t understand your function. The desire to receive does not disappear; it isn’t born, doesn’t develop, and doesn’t change; it is only concealed or revealed to the extent that it can be used. The concealment of the desire and its revelation are determined according to the steps of the spiritual ladder. The whole system is already arranged and built from the top down: As the levels descend downward, they conceal another part of the desire to receive in it. Its use is concealed from us, since we cannot use it correctly. To prevent the created beings from making mistakes as they ascend from the bottom up, the desires are gradually revealed to them, only the part of the desire with which they can work correctly. The whole spiritual ladder is a mark on the scale of how much of your desire can be revealed to you so that you can use it, so that you will be able to overcome it and will you want to correct it, and will not lose your head and want to fill it at any cost. If you were to immediately reveal a strong desire, you would only think of its egoistic fulfillment. If you were given a very high position, for example, you were in charge of all the radio stations and TV channels, then we would not see you in class. You would say that you have more important things to do, that you had to take care of the world. Therefore, you are not given this position but something much simpler. Everything depends on how much you can really worry and care about the world and, of course, according to what suits the world and whether its time has come. If we could advance more by ourselves, we could give the world more since it is ready for that. It is already open. We could bestow upon it more and bring it closer to us and together with it we could rise to a higher level. The world is the lower level, and we are the intermediate level, and above us there is an even higher level, the Creator. We have to awaken the world so that the world will awaken us. This means that we have to bestow upon it and to spread the message everywhere possible. Then the world will begin to awaken us, and we will be able to rise to the upper and perform the spiritual action for the world. Everything is already in its place, and it is called an inner circle, an external circle, and an even more external one. The problem is only in us. Opinion (George Friedman, Chairman of Stratfor): “It is the political dimension that has become the most important, not the financial. It may well be that the European Union is in the process of dealing with its banking problems and might avoid other sovereign debt issues, but the price it has paid is both a recession and, much more serious, unemployment at a higher rate than in the United States overall, and enormously higher in some countries. “We can divide the European Union into three categories by measuring it against the U.S. unemployment rate, which stands at about 7.7 percent. There are five EU countries significantly below that rate (Austria, Luxembourg, Germany, Netherlands and Malta). There are seven countries with unemployment around the U.S. rate (Romania, Czech Republic, Belgium, Denmark, Finland, the United Kingdom and Sweden). The remaining 15 countries are above U.S. unemployment levels; 11 have unemployment rates between 10 and 17 percent, including France at 10.7 percent, Italy at 11.1 percent, Ireland at 14.7 percent and Portugal at 16.3 percent. Two others are staggeringly higher — Greece at 25.4 percent and Spain at 26.2 percent. These levels are close to the unemployment rate in the United States at the height of the Great Depression. “For advanced industrialized countries — some of the most powerful in Europe, for that matter — these are stunning numbers. It is important to consider what these numbers mean socially. Bear in mind that the unemployment rate goes up for younger workers. In Italy, Portugal, Spain and Greece, more than a third of the workforce under 25 is reportedly unemployed. It will take a generation to bring the rate down to an acceptable level in Spain and Greece. Even for countries that remain at about 10 percent for an extended period of time, the length of time will be substantial, and Europe is still in a recession. “Consider someone unemployed in his 20s, perhaps with a university degree. The numbers mean that there is an excellent chance that he will never have the opportunity to pursue his chosen career and quite possibly will never get a job at the social level he anticipated. In Spain and Greece, the young — and the old as well — are facing personal catastrophe. In the others, the percentage facing personal catastrophe is lower, but still very real. Also remember that unemployment does not affect just one person. It affects the immediate family, parents and possibly other relatives. The effect is not only financial but also psychological. It creates a pall, a sense of failure and dread. “It also creates unrooted young people full of energy and anger. Unemployment is a root of anti-state movements on the left and the right. The extended and hopelessly unemployed have little to lose and think they have something to gain by destabilizing the state. It is hard to quantify what level of unemployment breeds that sort of unrest, but there is no doubt that Spain and Greece are in that zone and that others might be. “It is interesting that while Greece has already developed a radical right movement of some size, Spain’s political system, while experiencing stress between the center and its autonomous regions, remains relatively stable. I would argue that that stability is based on a belief that there will be some solution to the unemployment situation. Its full enormity has not yet sunk in, nor the fact that this kind of unemployment problem is not fixed quickly. It is deeply structural. The U.S. unemployment rate during the Great Depression was mitigated to a limited degree by the New Deal but required the restructuring of World War II to really address. Question: Most of humanity relates to Kabbalah with prejudice. How is it possible to correctly build Internet dissemination if a person who enters our site immediately realizes that he is dealing with Kabbalah? It is impossible to hide this from him. Answer: This is a very sensitive matter. This problem exists with us in the entire world. We are notable for Kabbalah study, and nowhere in the world is that embraced. I don’t know how it’s possible to break the resistance of human thinking. Even with us in Israel there is great rejection, no acceptance of the wisdom of Kabbalah. If we go forward with integral education, they accept us openly, but the moment that they discover that we are connected to the wisdom of Kabbalah, they immediately refuse and reject us. Serious and educated people suddenly turn completely primitive in that they are certain it is some kind of witchcraft or impure forces. And nothing really helps. They are not able to overcome their fear. Only time, a demand to the Creator, and our constant efforts will finally give a push forward with this issue. I think that we are lacking the overall effort, continuously and mutually trying to request help to change us from Above, and then the inner force of the Light will create new conditions. When our external efforts and our inner request for help from the Light will break through the ego and will invite in it at least some sparks of targeted longing, then people will no longer have prejudices. Question: Not everything that I do in life requires me to solicit help from my friends or from the Creator. However, these actions still lead me to the goal; for example, I get up in the morning and head to the congress all by myself. But there are actions I have been unsuccessfully trying to implement for 20 years now. Does it mean that these actions require applying the efforts that we talk about in the wisdom of Kabbalah? Answer: No. If you can’t do something at all, then it’s not about your effort. Exertion is about asking to be given strength to do something. Our appeal for forces is the exertion. We apply lots of efforts, but all of them are directed towards ourselves. Efforts start when we see that we are powerless to do anything at all. Real exertions are above human powers. Only when we run out of energy, a place for exertion appears. How can it be? Let’s say, I can lift a maximum of 100 pounds. Where is my effort here? I won’t lift more than this anyway. So, my effort is about asking for additional strength to increase the load. I did everything that was in my power: I got ready for the congress, registered, arrived, but in fact I am not there yet. We talk with friends, have joint meals, go for a walk, the weather is great, the air is clean…Are any of these actions considered to be my efforts? No! But it is only due to our efforts that we have gathered together. “We are ready! So give us strength!” This is what we scream about. In Kabbalah, this demand is called an effort. The Creator performs the action, not us. Our contribution is only the demand. Answer: So, lower yourself a little. No big deal! Do you always have to be macho? Where you will humble yourself you will see greatness. Modesty is a great thing. Our efforts are all about our demand to be humbled. You have to “pay” your friends to have them help you achieve this. Question: Are there any examples of this in nature? Do I humiliate a child to raise him? Answer: No, all you do is repetitively add complications to a child’s life and set up tasks of increasing difficulty for him. As to becoming more humble, it doesn’t originate from Above. You are the one who has to come to this point. This condition emerges when you are helpless, powerless to act and unable to reach the goal. Imagine that you want to lift 400 pounds even though your limit is 350. So, you ask the Creator to help you. Does He humiliate you in this case? Of course you did everything that was in your power: exercised a lot in order to lift 400 pounds so that you do it yourself rather than be indebted to anybody else. Yet, a spiritual path is different; here, you have to get the power of bestowal, the force of the Light, that you are still lacking. You cannot receive it if you don’t ask for it. You have to bow your head since otherwise you won’t be able to use this force. Similarly, a young child given adult things would get hurt. The child should move ahead step by step and understand causes and possible consequences so that his knowledge and powers will be a result of his own personal experience. Otherwise, he will turn into a terrible and destructive monster with a little intellect. Question: Why are our efforts to unite not enough for the Creator? Why does He want us to appeal to Him? Answer: Your demand signifies that you can use the powers that He gives you correctly. If you open your bestowing vessel properly, it means that you know how to handle the force He gives you, and vice versa, the absence of the correct demand shows that you are not ready to use the Creator’s gift correctly and that it would only hurt you and others if He grants it to you. Question: So it makes no sense to carry out the actions I can do myself? Answer: That is true. Accordingly, it is said, “Better sit and do nothing.” If humanity could only be satisfied with basic needs in food, having a family and children, then its path would be much more successful since, in this case, all their other forces would be devoted to the internal advancement and the rest would be left up to the Creator. This is the way Kabbalists expressed the essence of our relationship with the Creator. On one hand, “all is in deposit,” meaning nothing is given to us for free. It’s the law of nature in which we exist in which all its parts are clearly linked in cause and effect relationships. We judge nature according to ourselves, and so we think that there might be some inaccuracies, confusing and complicated things. But every time when we really explore nature, we discover that the laws are amazingly accurate and we marvel at the wisdom and the interconnectedness of nature. Presently, scientists recognize that there are other universes and dimensions besides ours. When I was a child, in school, we were told that our universe is endless and eternal. Then, it became known that it originated 14 billion years ago, and if we are talking about the time, then there is a beginning and end of the universe. This discovery was made by the American scientist Hubble after whom the space telescope is named. Later, scientists discovered that our universe is not only expanding, that it emerged from a point, but also, that it disappears as evidenced by black holes, etc. This points to the fact that everything is predetermined and defined in accordance with the laws of conservation, all is absolutely, clearly distributed. Therefore, it’s said, “the judgment is true, and all is ready for the feast,” meaning for the final and correct state. However, “a fortress spreads over all of life.” The Creator prepared an elaborate trap for humanity where the upper force guarantees that everybody will eventually return to the right state, but at some stage in the journey, we are given the freedom of will. Presently, we completely lack understanding of this fact. No science apprehends it because science exists in one plane, one line; there is no duality. When faced with duality, science gets stuck. Science reveals certain properties in nature, as opposed to ours, but it never comprehends the duality. Today, only quantum physics approaches this phenomenon. That’s why it is considered as “out of this world” physics, but not more. We should change ourselves, our mind, our feelings, and then we will be able to sense behind this a potential barrier, the boundary between the phases—it doesn’t matter what you call it. For us, this is transitioning the Machsom. The law of nature says that “the book is open and the hand writes… and the collectors return regularly, day-by-day, and collect from a person knowingly and unknowingly” (according to the upper court’s decision) meaning that the whole system is in a state of a precise and sealed form. However, we have two ways to go: Go to the shop and take whatever we want either knowing that everything is recorded and that we will have to pay the fee, or without knowing or even thinking about it. If a person is unaware of these things, it means that he still is in a different developmental phase; in this case, he is not being “charged” too much, just according to his level of advancement. People who study Kabbalah already understand that they are in a state where everything they borrow must be paid back and they automatically sign their names in the shopkeeper’s book. So, the very moment we receive anything, we have to start thinking hard about how to meet the owner, how to return the debt, and how to pay it. Every moment of our lives is recorded in His book, every breath, heartbeat, and action, because all that we have we receive from Him. “Don’t consider any moment to be insignificant,” each moment of life has to be paid for. But we have absolutely no way to keep this in mind, nor can we rely on the reminders to make us feel that we are actually marked in His book and that each of us will have to pay since we are in debt and that our debt constantly grows and accrues. And each subsequent time, our obligations become more demanding and rigorous. We have arrived at an interesting phase where we need to learn this law and to get to know its source. We are led there gradually, as small children. This law of development treats us gently and gives us a chance to get used to it.